With a powerfully built body, muscular tail, and a mighty jaw, the American Alligator has earned the reputation of being a fierce predator. The American Alligator (Alligator mississippiensis) is thought to have been around during the time of the dinosaurs, and to have survived the mass extinction that killed them. American Expedition is proud to present information, interesting facts & trivia, artwork, and photos of the American Alligator. The American Alligator is a large, semi-aquatic reptile inhabiting the southeastern United States. 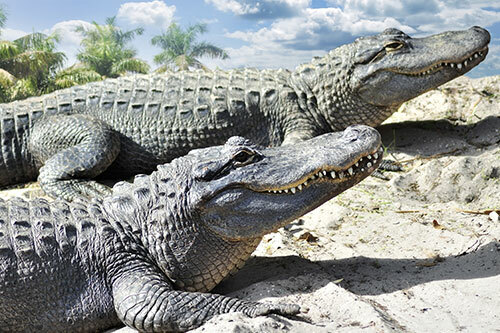 They measure between 10 to 16 pounds, with females, also known as “cows”, typically being smaller than the males, also known as “bulls.” A male alligator weighs approximately 600 pounds, while a female weighs nearly half as much. However, it is common to find an alligator weighing around 1,000 pounds. Alligators can range in color, but are normally dark green or black on the top with a white underside. On their backside, they are covered in “scutes,” which are bony plates located under the skin. 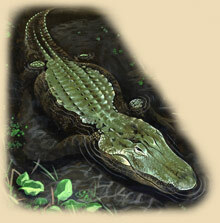 This creates an armor which serves as protection for the gator by preventing its skin from being penetrated. 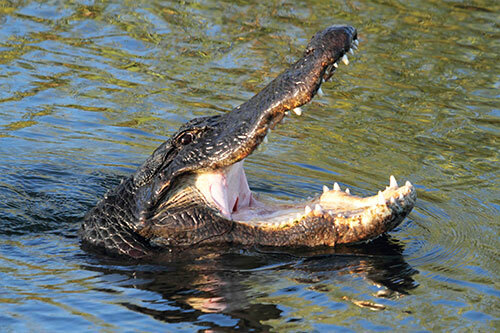 Gators can have up to 80 teeth at a time, with a new tooth growing in after the other has been worn down. They also have special flaps that cover the eyes, nose, ears, and throat when they are submerged in water. 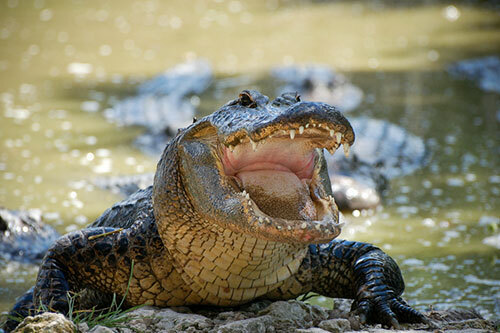 Although the American Alligator does not have vocal cords, they are one of the most vocal species of reptiles. Their loud call, which is produced by sucking air into the lungs and blowing it out, sounds similar to the roar of a lion. 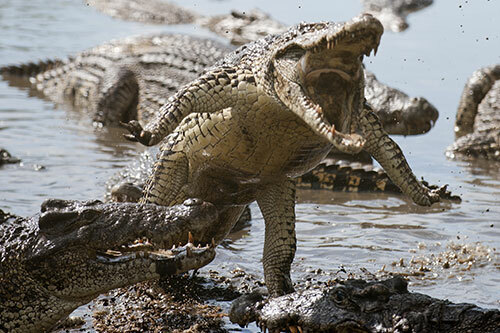 Gators will become vocal when they are aggravated, being defensive, or mating. At about the age of ten, alligators are mature enough to mate. Breeding season is in late spring. The male gator will attract a female gator using its loud call, and will oftentimes have to fight male competition. After mating, the female will build a nest out of sticks, mud, and grass and then lay between 20 and 50 white eggs. She then covers them with vegetation to incubate them. This lasts approximately 65 days and after this time, the baby alligators, also known as “hatchlings,” emerge from the egg and the mother carries them to the water in her mouth. The gender of an alligator is determined by the temperature during incubation. If it is 93 degrees Fahrenheit or above, the hatchlings will all develop into males. If the temperature is 86 degrees Fahrenheit or below, the hatchlings will all develop into females. The hatchlings, about 6-8 inches long, sport yellow bands around their body and grow only about 3 to 8 inches a year. The mother protects them for their first year. The lifespan of a gator in the wild can range from 35-50 years. Looking for gift ideas for alligator lovers? Find unique alligator gifts & decor in our wildlife store. A group of alligators is called a congregation. A gator’s jaw can put forth up to 2,000 pounds per square inch. The hatchlings will break open the egg shell in late August or early September. An alligator’s front feet have 5 toes, while its back feet have 4 webbed toes. An alligator can run about 11 miles per hour on land. 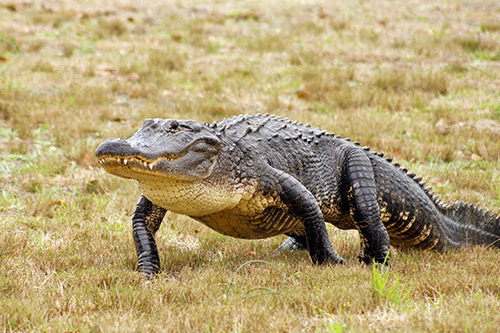 American Alligators are found in the states of Alabama, Arkansas, Florida, Georgia, Louisiana, Mississippi, North Carolina, Oklahoma, South Carolina, and Texas. Gators have skin sensors that enable them to feel vibrations in the water. An easy way to tell an alligator apart from a crocodile is to look at their snouts. Alligators have a long, rounded snout; crocodiles have a long, pointed snout. An alligator can stay underwater for up to an hour. Gators have extremely muscular bodies that help them swim and crawl on land. Alligators are semi-aquatic, meaning they are adapted for living in the water, but also spend some of their time on land. 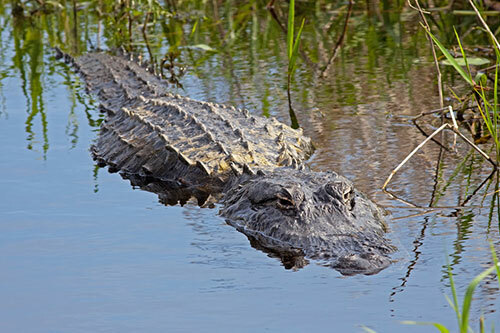 The majority of the alligators are found in the states of Florida and Louisiana. The alligator was on the brink of extinction in the 1960’s. Laws were then put into effect to protect this species, and they made an incredible come-back. They are now thriving with more than over 5 million in the wild. 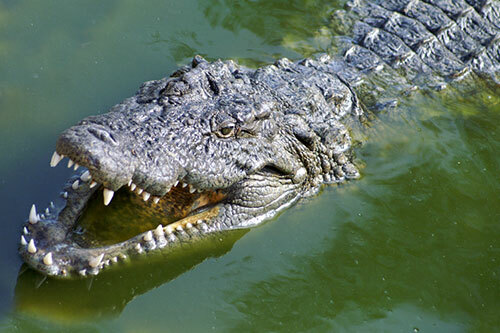 Scientists say that the American alligator has been around for more than 150 million years. Alligators are the closest species we have to dinosaurs. An alligator’s brain is tiny, only about the size of a quarter. 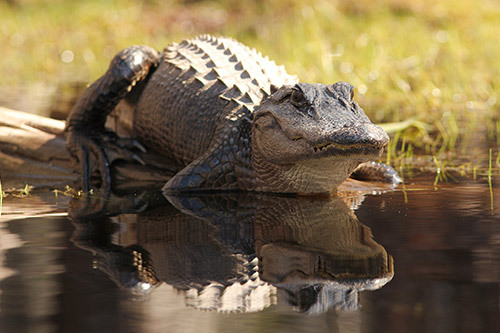 American Alligators are located in the Southeastern part of the United States. Gators like to occupy freshwater swamps, ponds, wetlands, and marshes that will provide them with plenty of food. Alligators are carnivores and feed on almost any animal. They particularly seem to enjoy fish, turtles, birds, other reptiles, and small mammals. Occasionally they will catch larger prey and drag it underwater to drown it, and then bring it above water to feed on it. Alligators are carnivores and feed on almost any animal. They particularly seem to enjoy fish, turtles, birds, other reptiles, and small mammals. Occasionally they will catch larger prey and drag it underwater to drown it, and then bring it above water to feed on it. Alligators are known as lurkers because they do not hunt for their food, but instead wait for it to pass by. When gators lurk, they float beneath the water with only their eyes and nostrils above the waterline. Alligators do not feed during cooler months. They begin to lose their appetite at 80 degrees Fahrenheit and stop feeding altogether at around 73 degrees Fahrenheit. They will last through the entire winter on their energy reserves and can survive freezing conditions if they remain in the water. Never approach a gator; they are typically very hostile creatures when trying to protect their territory or young. Do not feed alligators; if they associate food with humans they will become aggressive. Feeding alligators is usually against many state laws. Know an alligator's natural habitat and be alert when you are in it. Never throw objects at the alligator. If you encounter an alligator, look as big as you can, make loud noises, and quickly leave the area. If an alligator is chasing you, run away in a straight line. Do not allow children or pets to play or swim in freshwater areas in gator country. Use binoculars to observe gators from a distance. If you spot a gator out of its natural habitat and in human environment, call the state conservation department. They will capture it and return it to its territory. Alligators will often get out of the water and come onto the shore in order to soak up the sun's rays. 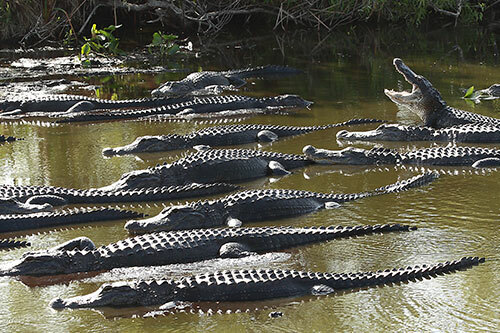 A group of alligators is known as a congregation. Alligators are the closest extant species we have to dinosaurs. If an alligator is chasing you, run away in a straight line. Gators are capable of making quick movements side to side. Know an alligator's natural habitat and be alert when you are in it. Don't let children or pets swim in lakes in alligator country. Interested in Alligator Gifts & Decor? Visit the Alligator section of our wildlife store!